Thank you for visiting American Fitness. We enjoy helping our customers find quality home and commercial fitness equipment to achieve their health goals. Your satisfaction is important to us! Have questions? Need help placing an order? Our friendly fitness equipment experts are available to help by phone or email. Note: Please do not return products to the mailing address above. See the Return Policy for more instructions. 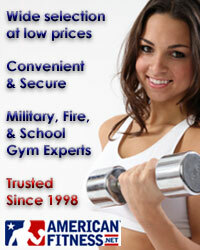 American Fitness accepts VISA, Mastercard, American Express, Discover, and PayPal. Orders can be placed online at AmericanFitness.net or by phone. If you are experiencing problems ordering using a credit card, please ensure 1) that you are not over your daily limit as set by your credit card company or employer, if using a company card, and 2) your billing address matches the address on file with your credit card company. If it does not match, our credit card address verification program will reject the card. Most items ship unassembled. Assistance with assembly and installation can be arranged for an additional fee. For more information, please contact Customer Service. Our fitness equipment experts can help with custom quotes for commercial and government purchases. For commercial business-to-business and government orders only, American Fitness can accept purchase orders and provide invoices. American Fitness is a Schedule 78 GSA contract holder. For government entities looking to order on GSA Schedule, please see GSA Fitness Equipment. We are a woman-owned, small business, registered in the Central Contractor Registration (CCR) database and the Wide Area Workflow (WAF) database. If you need a quote, please give us a call or fill out our Commercial Account Form. Leasing is available for commercial business-to-business orders only. Regrettably, we do not currently offer personal financing plans. If you are interested in business leasing, please contact us and we will have our leasing expert walk you through the process. American Fitness is not liable for pricing errors. If you place an order for a product that was incorrectly priced, we will cancel your order and credit you for any charges. In the event that the order is inadvertently shipped based on a pricing error, we will contact you with the correct price and obtain your authorization for the additional charge, or assist you with returning the product. If for any reason you are not satisfied with your order, you have 14 days from receipt of the order to return it. All returned products must be in new, unused condition, in the original box, and include all documentation, parts, and accessories. A Return Authorization Number is required for all returns. Please call customer service at 1-800-895-4181 or contact us by email at admin@AmericanFitness.net to receive a Return Authorization Number (RAN), which allows us to keep track of the return. Products showing signs of wear or use cannot be returned. Customers are responsible for all return shipping charges. Returned products must be shipped back to the original manufacturer warehouse. American Fitness recommends that customers obtain a tracking number and shipping insurance to cover any potential damage or loss of the product by the shipper during the returns process. To better ensure timely processing of refunds, American Fitness requests customers to forward tracking information for returns to our customer service department, so we may confirm receipt by the manufacturer. If your order arrives at your door damaged, broken, or defective, American Fitness will work to resolve the issue by either 1) replacing broken parts, or 2) shipping a new replacement product. When replacing parts, American Fitness will work with the manufacturer of the item to process the request as quickly as possible. Please note that we are not able to express ship replacement pieces. To report damaged or defective items, please contact us via telephone at 1-800-895-4181 or via e-mail at admin@AmericanFitness.net. Please include a full description of the issues, as well as your order number. If you have placed an order and would like to cancel it, please call us at 1-800-895-4181 or email us at admin@AmericanFitness.net within 2 hours. Orders are automatically processed on a continuous basis. We make every attempt to cancel your order as long as the product has not left the warehouse. Once your order has entered the shipping and handling process, it cannot be canceled. American Fitness occasionally issues coupon codes for special discounts during promotional periods. AmericanFitness.net also offers promotional free shipping on limited specified product SKUs. Promotional offers are valid only in the US for legal US Residents only. Coupons may be redeemed one time per person or address, unless otherwise specified. Offers are valid at AmericanFitness.net only. Offers are limited to in-stock items. No rain checks. Offers may not be applied to previous purchases. All free shipping offers are limited to addresses in the continental United States. Additional shipping charges apply to Alaska and Hawaii. AmericanFitness.net does not currently ship outside the United States. Customer satisfaction is important to us. If you have any questions about our policies, please contact us via e-mail at admin@AmericanFitness.net or via telephone at 1-800-895-4181.